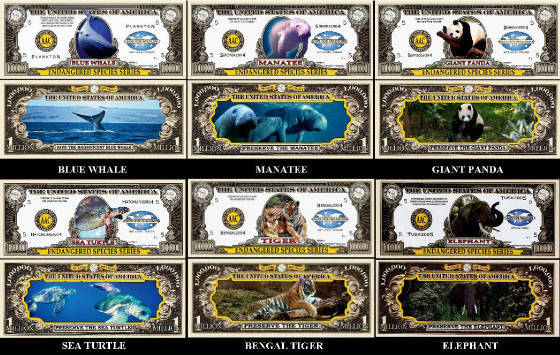 Here's your chance for you to collect all 6 of our Endanagered Species Bills while they are still available. You can re-sell them and start your own business if you wish to, or buy them separately or in a complete set; the more you purchase the cheaper they are! A perfect gift for any collector! 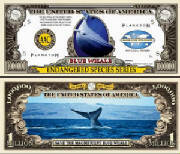 If you love whales, then this dollar bill is the one for you! 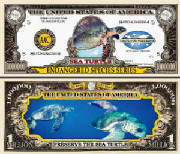 Not many of these sea turtles are left; let's save them! 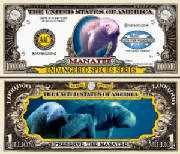 The Manatee is going fast; lets preseve them from endangerment! 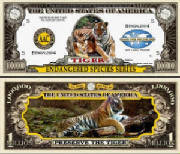 The Bengal Tiger was one of the most feared hunters of all! 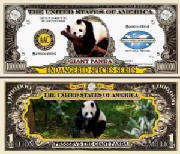 Why the giant panda bear is near gone, no one knows! 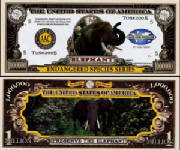 We need to save the Elephant!